Edward Richard Buxton Shanks (1892-1953) was a writer in many fields: he wrote and published a number of poems in the Great War, and afterwards wrote works of criticism (books about Edgar Allan Poe and Rudyard Kipling, among others), and novels. a number of his publications have science-fictional or fantasy elements, as the Encyclopedia of Science Fiction entry notes. But undoubtedly his most significant work was The People of the Ruins: A Story of the English Revolution and After (London: Collins, 1920). He was born in London, and educated at Merchant Taylors’ School. He gained a BA in History at Trinity College, Cambridge, in 1913; during his last year he had been editor of Granta. After his war service he was a literary reviewer, briefly a lecturer at the University of Liverpool (1926), and from 1928 to 1935 he was the chief leader-writer for the Evening Standard. 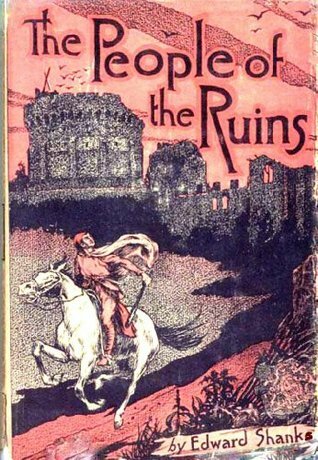 The People of the Ruins could be seen as a Great War novel: it demonstrated the ease with which the veneer of civilization could be lost, and people could revert to tribalism and barbarism: in this it is very like Cicely Hamilton’s Theodore Savage (1922). But The People of the Ruins has other preoccupations too, particularly the dire effects of socialism/communism and the power of the workers. The protagonist, Jeremy Tuft, has been a physicist before 1914: his papers on viscosity gained him a European reputation—”that is to say, it had been quoted with approval by two Germans and a Pole, while the conclusions had been appropriated without acknowledgement by a Norwegian” (7). He was in the artillery during the Great War, rising to the rank of captain. By 1924 he was a lecturer in physics at a college in London. In April 1924 there was a Great Strike, and he rashly went to Whitechapel, one of the hotbeds of dissent, and there he was struck by a bomb, which somehow or other throws him forward to Whitechapel Meadow in 2074. Most of the novel takes place in that year. The population of Britain, and apparently of other countries in the world, is a fraction of its former strength. Much of London is in ruins, or has been demolished; as a result London is much greener, its air is cleaner, and so is the Thames. But most of the trappings of civilisation have disappeared, and technology has reverted to pre-industrial levels. At the end, he and his love Eva are in the countryside outside London. She dies; he falls into despair. He knows the Welsh are coming again to attack London, and they would destroy yet more. Cities would be burnt, bridges broken down, tall towers destroyed, and all the wealth and learning of humanity would shiver to a few shards and a little dust. The very place would be forgotten where once had stood he houses that he knew, and the roads he had walked with his friends would be as desolate and lonely as the Stane Street of the Romans. Even all this story, his victory and his defeat, his joy and his sorrow, would fade out of the memory of man. But what did all this matter to Jeremy Tuft, who, wonder and portent that he was, strange anachronism, unparalleled and reluctant ambassador from one age to the next, had suffered in the end that common ill, the loss of the belovèd. He raised the pistol slowly to his head (290).